A few years back I wrote an article Unconventional application of Two-factor Authentication!. It was a huge success – I received several emails from people requesting me to write another article to show something on restricting login flow to once, based on the condition; instead of, running the flow more than once. Before we move ahead, do check out this article to learn about Lightning Flow Designer and some hidden tips and tricks. Display message once in a day. And, there should be two days gap between the display of each message. 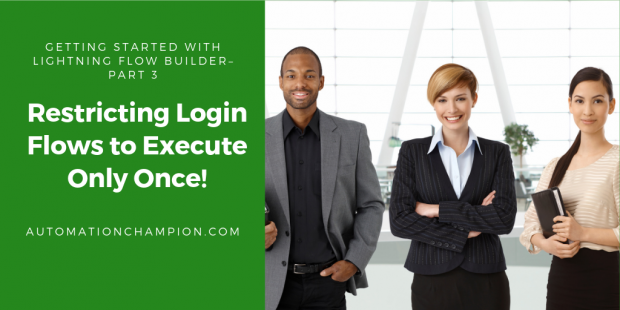 Today, in this article, I am going to show you how you can configure to control the Login Flow to execute only once. Let us start with a business use case. Martin Jones is working as a System Administrator at Gurukul on Cloud (GoC). GoC is in the process of updating the employment agreement. Management at GoC wants to use Salesforce to make sure that every user reads the employee agreement and agrees to it. Until they agree, don’t allow them to login into Salesforce. 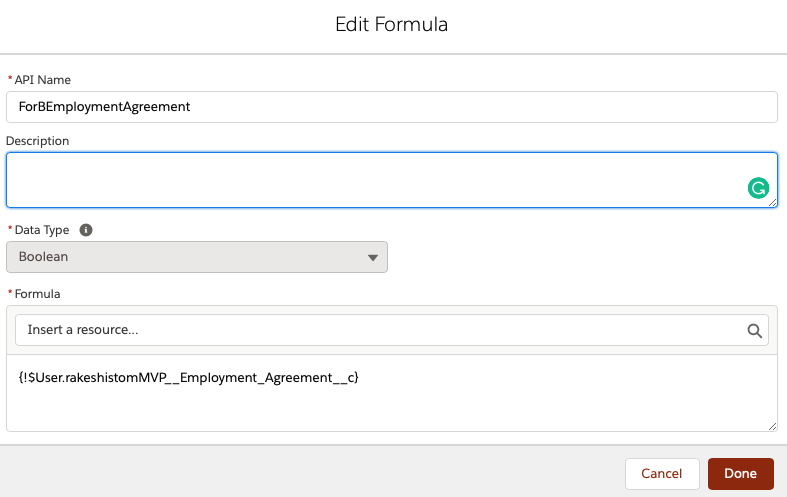 To solve this requirement, we will use many ingredients – including, Lightning Flow, Login Flow, and a Custom field (Employment_Agreement__c) on the User object. Before trying to understand the technical aspect of the solution, let us spend some time to understand the general flow of our solution at a very high level. Please spend few minutes to go through the following flow diagram and understand it. Once you understand the above flow diagram, developing the solution will be swift. In this example, I am using a flag/field (Employment_Agreement__c) to determine when to show the login Flow. Log-in into your developer org. Create a Custom Field (Employment_Agreement__c) on the User object. Navigate to Setup (Gear Icon) | Setup | PLATFORM TOOLS | Process Automation | Flow. Now click on the New Flow button; it will open the Lightning Flow Designer for you. The formula field will auto-populate (by auto launching the Login Flow) as soon as user successfully logged-In. Yes, it is possible to use HTML tags with base Lightning Flow components (which come from Visual Workflow). The next step is to create the path for Agreed and Not Agreed conditions. Agreed:- We will use Update Records element to update the Employment_Agreement__c field to True on the Logged-In user record. Not Agreed:– We will display the message and then, as soon as a user clicks on the Finish button, we will forcefully logout him/her out. Once you’re done, Save the flow and name it Restrict Login Flows to once, with Type: Screen Flow. Do not forget to activate the Flow by clicking on the Activate button. It’s time to test the Login Flow! Now, if a User with profile Standard User tries to login without agreeing with the new employment agreement, the system will forcefully log him/her out. If they accept the new employment agreement, then the system will never show them login flow anymore. –> If you like this article, or would like to share some ideas for enhancements then, please do so. I will very much appreciate it. Thanks in advance. Note: – I am grateful to Resco.net, Smartcloud.io, and Taveza for sponsoring my blog. @Rakesh Thanks. I was able to replicate the steps and it works like a charm. However the target=”_blank” attribute is not working.When one clicks on the href link, it opens same Salesforce page. Is your href behaving correctly? It works for me in Safari. It is not redirect the user to specified URL.